Over the past five years, around 2 million kilometres, in over 400 cities, have been cycled by cyclists using the Bike Citizens bicycle App. Put it another way, this means that the Bike Citizens community has cycled a distance equivalent to the moon, 5 times. That’s quite a lot! But who can claim to have driven to the Moon? No, that’s also probably not a good comparison to imagine. What would it be like to have a video in which movement flows and kilometres travelled are represented as a heatmap? That’s what the makers of Bike Citizens thought. They then created an end-of-the-year review for Bremen, Vienna, London and Madrid in which it could be seen where and when cyclists were on the road. During rush hours, a heatmap looks similar to an anthill. Even in the early hours of the morning there are quite a number of people who travel by bike. Heatmaps provide a good way to visualise patterns of movement – for the community, but also for individuals – create your personal heatmap. A look at the activity overview within the Bike Citizens App shows how large the personal route knowledge is and how many other routes can yet be discovered. The route knowledge is defined by the number of individual routes travelled using the app in the users city – compared to the ratio of all routes able to be walked or cycled on. A look at the activity overview shows how large the route knowledge is and how many other routes can yet be discovered. Bike Citizens strives to make cycling more accessible in cities for many people and to positively influence city planning – doing so with a more efficient evaluation of cycling data through the self-developed bicycle App. A undertaking by which each individual cyclist can make their own contribution. App users optionally submit their records and in this way, provide records which aid for city planning purposes. Heatmaps are formed by the anonymous App users “activity data” being evaluated and shown in heatmaps. Heatmaps displays frequently travelled routes in highlighted colours and provides mobility behaviour information about everyday cyclists. 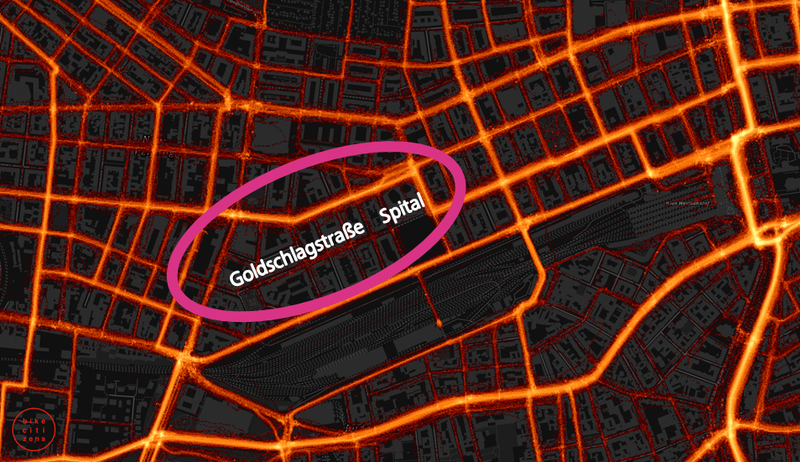 An example where heatmaps could be beneficial in practice, is by Goldschlagstraße in Vienna. Goldschlagstrasse was recently opened for cycle traffic. The Bike Citizens heatmap demonstrates the need for an opening. With heatmaps being created in this way, the results are a new and more complete map of our urban environment. For this overall picture, the resulting behavioural patterns that appear are of great importance: “Congestion is here every morning”, “Over there should really be a bicycle path” or “This crossing is avoided – could the reason be a lack of safety?” Experiences such as these can help by beneficial decision making in city planning and for the implementation of necessary improvements (such as construction measures against congestion). Therefore, every cyclist has the opportunity to contribute positively and influence the future measures taken in their living environment. By implementing this objective, Bike Citizens can build on the findings from numerous research projects. Currently, for example, the feasibility of analytical tools for the analysis of the recorded cycling data is being researched in a study entitled “Space-Tech for Cycling” (link only available in German) for the European Space Agency, ESA. In the coldest season of the year nothing impresses more than winter wonderland. Cycling in the chilly winter can, arguably, be more charming than on hot summer days. Whether it is a cold clear crisp sunny day, streets are covered with fog or snow covered paths – cycling in winter is definitely an experience. Using winter proof equipment and tires, as well as good lights there is no reason to spare your beloved bicycle during the colder season. Au contraire, by joining the Bike Citizens Winter Challenges you will experience how much fun cycling can be during winter! Apart from the fun factor, the outdoor activity strengthens your immune system, activates your body‘s defense and keeps you strong and fit. For Tilmann Waldthaler the dream became a vocation. For around 40 now years the Italian-Austrian globetrotter has been travelling across all the earth’s continents by bike. What motivated him? And what experiences has he had? Plus his top tips for long-distance cyclists.